The first thing that happens after Erica (Rooney Mara) breaks up with Mark Zuckerberg (Jesse Eisenberg) in "The Social Network" is that he goes back to his residence hall. It's a long, long walk, even though Mark takes it at a clip that's closer to running. Why, after the rapid-fire skirmish in the opening scene, would the movie take so long to simply get Mark from the Thirsty Scholar, just off-campus, to Kirkland House? Well, for one thing, it's an opportunity to roll the opening credits. But at one point this was envisioned as the most extravagant sequence in the picture -- and that's saying a lot, given that it was directed by David Fincher ("Fight Club," "Zodiac," "The Curious Case of Benjamin Button"). According to Michael Goldman's cover story in the October issue of American Cinematographer, the whole trek was designed to be accomplished in one long take, with multiple cameras stationed along the route. The footage (if you can still call it that, when the images are being captured on 16GB CF cards) would then be stitched together in post-production to create one seamless shot. 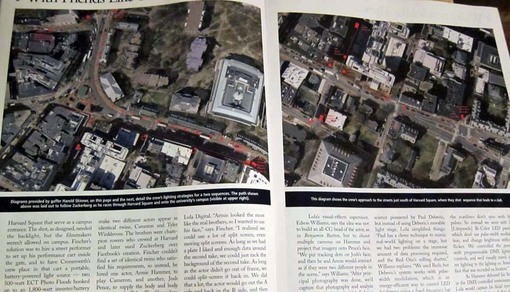 There's even a satellite map of the course in the magazine. That's not what Fincher eventually did (and it's not, as the long-lead glossy says, the "opening shot"), but I think he accomplishes the same thing with a less showy effect. This protracted sequence shows Mark physically embedded/immersed in what I like to call "the analog world," where speed and distance are not fiber-optic illusions, and things cannot be in more than one (virtual) place at a time, much less made available to hundreds or thousands or millions of computers from a dorm laptop with a few clicks in a matter of milliseconds. It is not the world in which he feels most comfortable, and he needs to get through it and back into his head as quickly as possible, even though it takes a long time to do so. Mark is frequently shown as out-of-synch with his physical environment: wearing Adidas sandals on his bare feet at a hearing, stumbling through a snowy courtyard in shorts and flip-flops as if surprised to find this cold white stuff on the ground, standing in a Palo Alto swimming pool with his t-shirt on, intentionally dressing inappropriately (in robe and pajamas) for a business meeting. It's part of his contrarian streak, and it becomes part of his image as a net maverick, but most of the time it's because he simply isn't thinking about it. Director of photography Jeff Cronenweth ("Fight Club,"K-19 The Widowmaker," "Down With Love") mentions, in the American Cinematographer piece, some of the technical challenges of shooting with small Sony Red One digital cameras in low-light (which is how most of "The Social Network" was photographed) -- especially when it comes to depth of focus. Watching the movie the first time (and not thinking about the practical limitations), this struck me as an effective directorial technique. This is an internal picture, about things that take place in small, dimly-lit rooms (and a few fluorescent-bright conference rooms), mostly in the winter and largely at night. Not only that, but it's primarily about what transpires in people's heads, as well as their computers. And so, as a rule (I'm sure there are exceptions), the interiors are shot with a shallow depth of field that allows only one person or set of people to be in focus at any given time. In the foreground or the background other people are often visible, but they are not in focus -- whether they are attempting to engage with Mark or whether they're just people in a crowd. You have part of my attention -- the minimum amount needed. The rest of my attention is back at the offices of Facebook where my employees and I are doing things no one in this room, including and especially your clients, are intellectually or creatively capable of doing. Did I adequately answer your condescending question? This is just the kind of aria that screenwriter Aaron Sorkin loves to write, and Fincher's directorial approach to the material offsets it superlatively. I kept thinking many of these zingers (one-liners and entire speeches) are perfect examples of L'esprit de l'escalier wit -- the kinds of things you wish you'd said, but didn't think of until later when you were on the stairs. That became part of the stylized texture of the film for me (and there are lots of stairs!) -- which may be why Sorkin's overwriting didn't bother me here (though I resisted it through the first part of the opening scene, until it clicked for me what was going on). For me, plot has basically been this necessary intrusion on what I really wanted to do, which was just write dialogue. What Fincher is doing with his dark, claustrophobic frames, narrowing his focus to one face (mostly Mark's) or plane at a time, is a visual correlative to Sorkin's solipsistic dialogue -- which are often more like interior monologues spoken out loud as if they were texts, elongated tweets or blog entries. Directorially, "The Social Network" negotiates a fine line between hyper-stylization (in lighting, structure, delivery of dialogue) and what may strike many as solid realism (nearly all the exteriors are in crystalline deep-focus, dramatically contrasting with the interiors' shallow depth-of-field -- and bless the tripod!). Camera operator Peter Rosenfeld told American Cinematographer, "What David wanted was evident right away. He likes symmetry -- balanced compositions, strong lines, level frames, zero keystone effects. He favors [dolly] track and avoids cranes as much as possible. I believe there is only one handheld shot in the entire movie. David was so clear on what he wanted visually that camera placements and focal-length choices were easy to make." The immediate effect -- the bright light, the wide open space -- is jarring. This is the only part of the movie to which Mark is in no way connected, because it takes place in another country. And yet it's where Cameron Winklevoss, after losing a very close crew race on the Thames, is finally persuaded that he, his twin brother Tyler and their partner Divya Narendra have done all the right things... and now it's time to go after Mark in court. The fake miniature look puts the decision in perspective. For one thing, it makes the whole rowing scene look tiny and quaint in the grand scheme of things (in contrast with the dark tones and dramatic close-ups and medium shots of most of the rest of the movie). They've just been condescended to by European aristocracy (and they're not accustomed to being anywhere below the top of the social hierarchy -- through their dad's connections they got a personal meeting with the President of Harvard to complain that Mark stole their idea!). They are lightly dismissed by the Prince of Monaco, "a country the size of East Hampton." Their father tells them not to apologize for losing such a close race, which exacerbates their frustration at their childlike helplessness. And then the final blow: their host mentions that his daughter at Oxford has already seen the race -- on Facebook. So, the race itself has been dwarfed and subsumed by the increasing magnitude and reach of Facebook. The Winklevii are headed to the Beijing Olympics, but they know they want top status in the online world, and no little nerd is going to shut them out. As they hash it over one more time, Tyler sits behind Cameron as if they were in a racing shell, with Divya in front of them as coxswain. The movie contains several jokes about the boys being identical twins, my favorite being Tyler's "fightin' words" pronouncement: "I'm six-five, 220-pounds and there are two of me!" Technically, he's just about right: Cameron is played by Armie Hammer; Tyler's head, voice and hair are also played by Armie Hammer, and his body by Josh Pence. This is the technological legacy of "Benjamin Button." Then there's the Harvard guest speaker who tells Mark, Eduardo and other students that the "next Bill Gates" could be sitting right there in that room. I assumed that was a digitized Bill Gates, telling the story of the BASIC code he and wrote for the Altair 8800 they'd seen on the cover of Popular Electronics magazine. But Fincher tells EW.com's PopWatch blog that it was a Gates impersonator, looped by a Gates voice double -- a 24-year-old black kid with dreadlocks. You wouldn't necessarily notice how much CGI and other visual effects are used in "The Social Network" (and the same can certainly be said of "Zodiac," but once you do, there's even more to appreciate. "The Social Network" is Fincher's least flashy movie, focusing on the flashiest and most ephemeral of subjects: Internet technology. Some people who haven't seen the film are still dismissing it as trendy and insubstantial because it's "about Facebook." As the fictionalized Mark Zuckerberg might respond: "I hadn't heard. Tell me more." Or, as Bill Gates was often known for saying: "That's the stupidest thing I've ever heard in my life!" All screen captures taken from the famous trailer.